Investigation underway to identify suspects, says Secret Service spokesman. 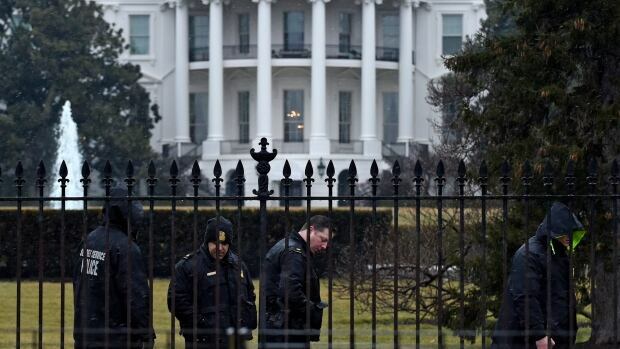 A small drone flying at low altitude crashed into the White House complex before dawn Monday, the Secret Service said. President Barack Obama was not at home. The crash prompted an immediate lockdown of the White House campus until officials could determine that the device didn't pose a threat. The Secret Service said the device was a commercially available quadcopter — a small, unmanned aircraft that is lifted by four propellers. "An investigation is underway to determine the origin of this commercially available device, motive, and to identify suspects," said Secret Service spokesman Brian Leary. He said the drone crashed on the southeast side of the White House complex just after 3 a.m.
Quadcopters make up many of the small drones used by hobbyists and commercial operators. Often weighing only a few pounds, they sell for as little as a few hundred dollars or less, and were popular Christmas gifts last year. The president and first lady Michelle Obama are travelling in India and were not present for the incident. But it was unclear whether their daughters, Sasha and Malia, were at home at the time of the incident with their grandmother, Marian Robinson, who also lives at the White House. The White House had said before the president's trip that the daughters would remain in Washington so not to miss school. Police, fire and other emergency vehicles swarmed around the White House in the predawn hours, with several clustered near the southeast entrance to the mansion. The White House was dark and the entire perimeter was on lockdown until around 5 a.m., when those who work in the complex were allowed inside. After daylight, more than a dozen Secret Service officers fanned out in a search across the White House lawn as snow began to fall. They peered down in the grass and used flashlights to look through the large bushes that line the mansion's driveway. While the circumstances of this incident were not immediately clear, previous security breaches at the White House have led to questions about the Secret Service's effectiveness. Four of the agency's highest-ranking executives were reassigned earlier this month. Former Director Julia Pierson was forced to resign last year after a Texas man armed with a knife was able to get over a White House fence in September and run deep into the executive mansion before being subdued. An independent panel, which investigated the agency's leadership and practices in the wake of the September incident and the disclosure of a previously unreported security breach earlier that month, recommended hiring a new director from outside the agency. That report was the second critical review of the agency responsible for protecting the president. In November the Homeland Security Department, which oversees the Secret Service, released an internal investigation about the fence-scaling incident, which concluded that poor training, staff and a series of missteps led to the breach. Homeland Security investigators found, among other things, that uniformed agents patrolling the White House grounds the night of Sept. 19 mistakenly assumed that thick bushes near the mansion's front door would stop the intruder.